This noisy sequel barrels along at a breakneck speed, whizzing from one brightly coloured giddy confection to the next. It’s a ride, with director Dave Green ensuring plenty of bang for your buck, and somehow managing to keep all of the story’s disparate parts together. 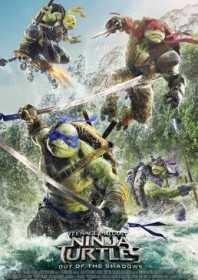 There’s a nod to The Secret of the Ooze with the introduction of a new goo which could turn the turtles back into human form; something which sparks a rift between the boys. There’s also the origin stories of new characters like mad scientist Baxter Stockman (Perry) and failed cop Casey Jones (Amell), who provides a new hunky distraction for the increasingly vacant April O’Neil (Fox). We also get a dose of Krang, a bratty brain living in the guts of a giant robot, who orchestrates a hostile takeover of Earth from some mysterious fourth dimension. And then there’s Bebop and Rocksteady, those perennial mutated numbskulls from the cartoon who prove to be just as annoying in live action as they were in animated form. Shredder returns, too, although he’s unceremoniously discarded from the story. For some strange reason, the great Laura Linney shows up as the hard-nosed Police Chief in charge of managing all the carnage. She even has the good grace to play along instead of phoning in the role. None of it makes any sense, and there’s never any attempt to create genuine tension or peril. It’s all just a big, brash blur of action. There’s the turtles’ version of the Batmobile; a dump truck with nunchaku-wielding arms which fires manhole covers from under the bonnet. There’s a huge Deathstar thing – Krang’s Technodrome – which assembles in the skies above New York like something out of Independence Day. A death-defying plane jump is probably the best action sequence, although it doesn’t quite trump the mad snow chase from the first film. The creaky humour keeps the overall tone lighthearted without ever being particularly funny, and it is the chemistry between the four superheroes which is far more engaging.